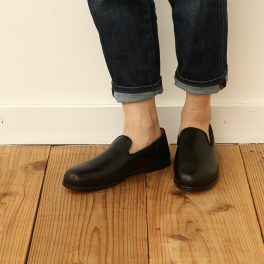 Slip-on shoes of the wax leather. We dye this soft leather using the steerhide with dye and I plaster wax and am finished leather. The traces such as the wrinkle called the natural stamp, awound, the blood vessel characterize the soft leather. An appearance and the beauty that are plane playing an active part through the year are good points. Even trouser suit-style is congenial; one pair for all ON/OFF. You match it with thin socks and pantyhose and, to a bare foot, am beautiful in the spring and summer. You can enjoy the combination of colors with color tights in the fall and winter. 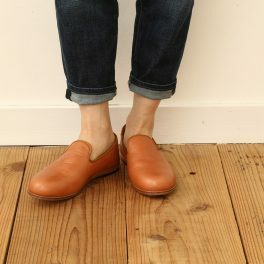 If you wear it, and feelings are well soft, too, and the long-time walk is more comfortable than normal leather sole, too. The lady’s plane toeshoes which I wear it, and a feeling has good. I made the transcription print of the leopard pattern on suede cloth leather of the chrome tanning using thick pig leather. Omitted the heart of the heel; is soft; wear it, and the feeling enhances flexibility of the pig leather. 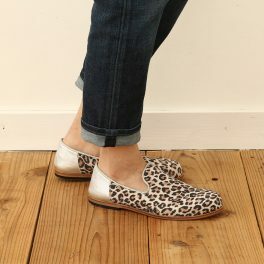 Because these shoes are leather sole, it is casual, but it is refined, and the adult woman directs it. 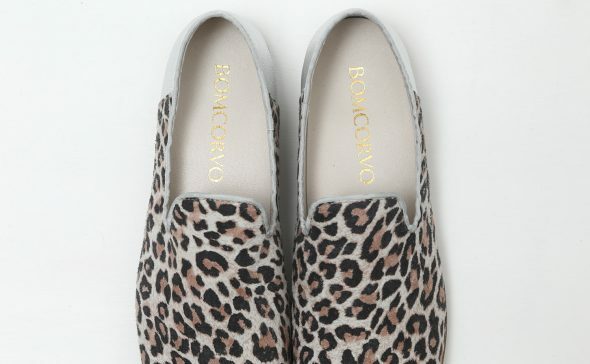 Of course the light coordinates that showed an ankle are wonderful, but it is cool with bottoms of the long length that the tiptoe of these shoes is seen in total. 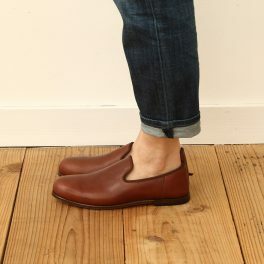 Outer wing plain toe shoe of oiled leather. Dyeing leather of tanning tanned cattle, after containing a lot of oil, finishing with finishing with glossy finish. You can enjoy the secular change unique to simple plain toe design. By omitting the toes and heel core It became very soft comfort, It is also characterized by the goodness of return of the sole.